How to make the best Guinness beef stew recipe. 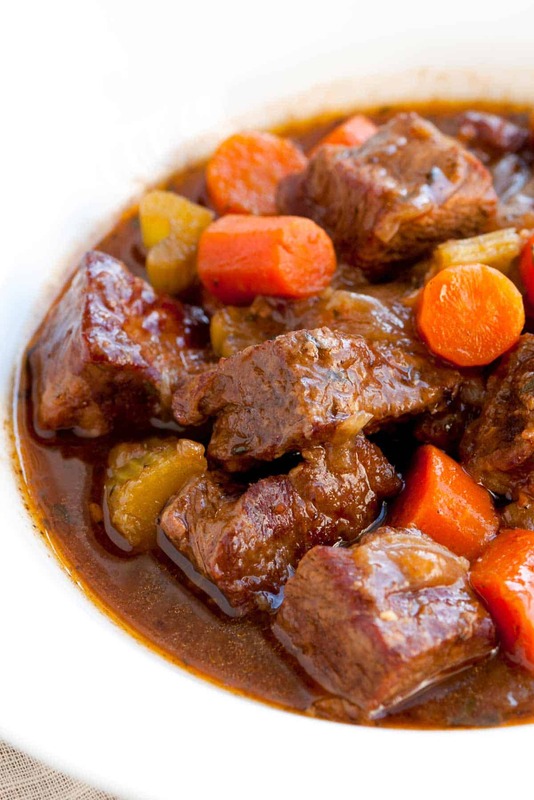 Jump to the Guinness Beef Stew Recipe or read on to see our tips for making it. 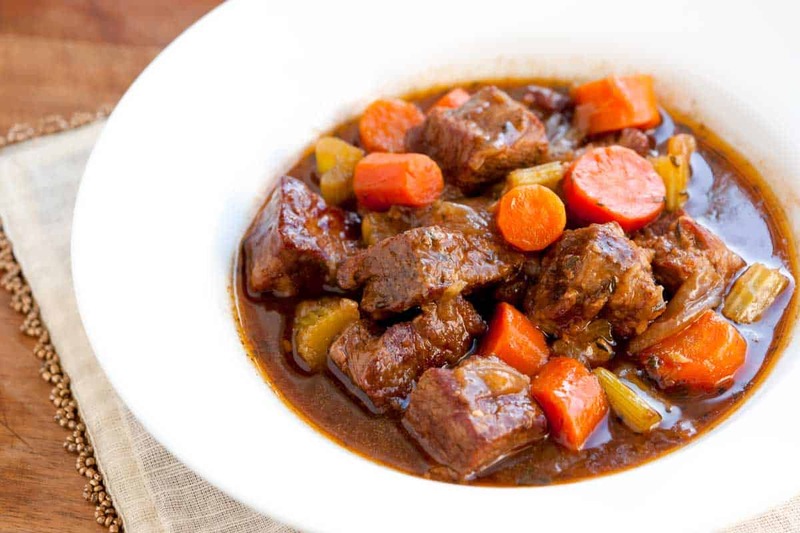 Believe it or not, beef stew is simple to make. This version, made with Guinness beer, is no different. The stew is savory, rich, and irresistible. Stews need time. You can’t rush them along. 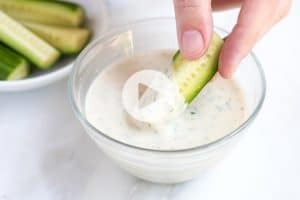 For this recipe, you will need just over 2 hours. That’s not 2 hours hovering over a stove, though. The good news is that your hands-on time is about 30 minutes. YOU MAY ALSO LIKE: This dark chocolate cake is inspired by a tall glass of Guinness and it has Guinness added to the batter. 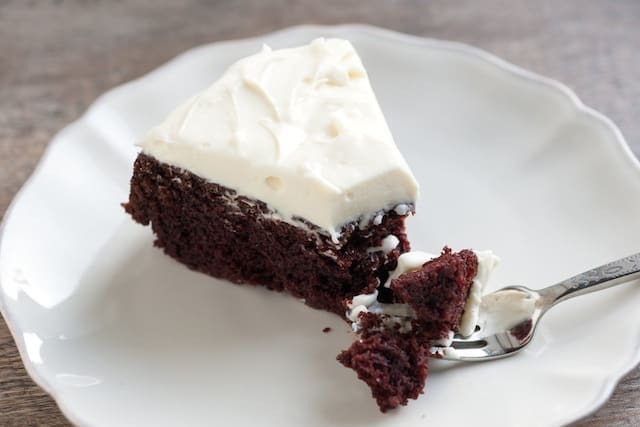 Jump to the Guinness Chocolate Cake with Creamy White Frosting. Here are four tips for making the best, most irresistible stew. We know this seems a little fussy, but it is worth your time. Moist meat does not brown. 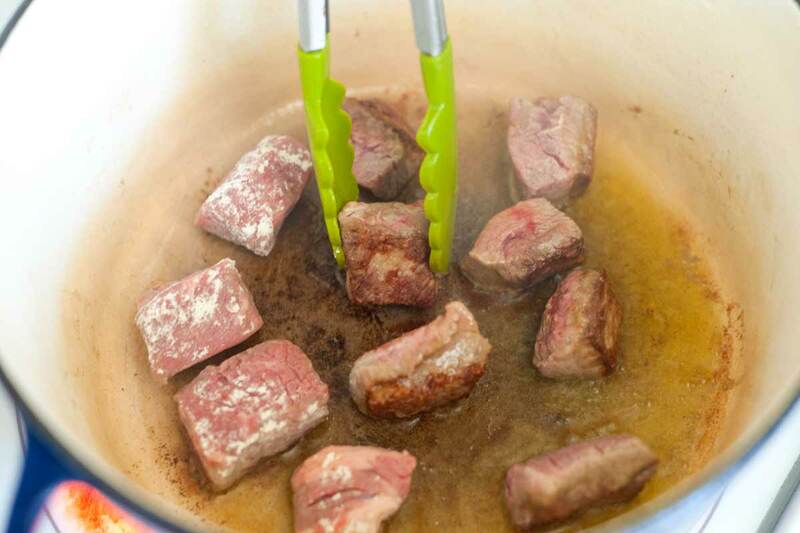 Browned meat is important for flavor and texture in the stew. So patting the meat dry with a paper towel before searing it is a big deal. This is an extension of tip number 1. To be sure the meat is as dry as possible, roll it in seasoned flour before searing. This guarantees a good sear on the meat. Now that the beef is dry and floured, it’s time to sear it. You’re not looking to cook it all the way through — you only want to add a nice brown crust. The best stews have many layers of flavor. In this recipe, Guinness adds richness to the stew. (Dry red wine or coffee would also do the trick). When adding the beer, scrape all the bits stuck to the bottom of the pot after browning the meat. This enriches the stew even more. At this point, the stew is about ready to go into the oven. Add everything to the pot and slide it into the oven. After about 2 hours the stew is ready. 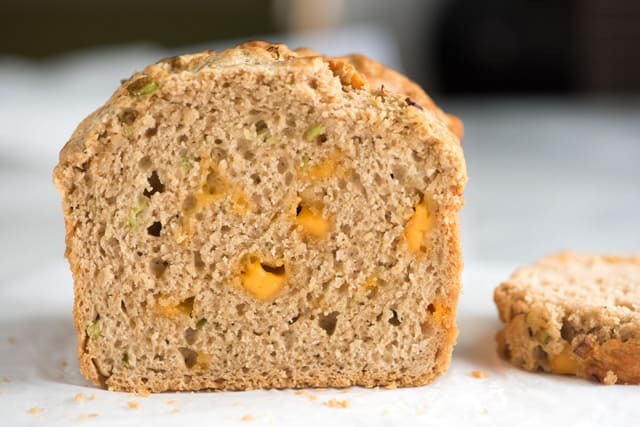 YOU MAY ALSO LIKE: This Easy, Cheesy Beer Bread! Beer bread is a genius recipe. All it takes is 4 ingredients to make the basic recipe: Self-rising flour, beer, butter and sugar. This beef stew is savory, rich, and irresistible. Stews need time. You can’t rush them along. 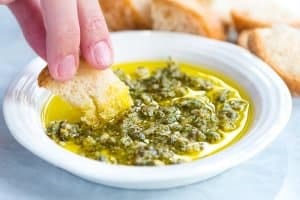 For this recipe, you will need just over 2 hours. That’s not 2 hours hovering over a stove, though. The good news is that your hands-on time is about 30 minutes. Using paper towels, pat the beef dry. Season beef all over with salt and pepper, and then roll into the flour so that all sides are lightly dusted. In a large Dutch oven, heat 2 tablespoons of oil over medium-high heat until shimmering. Then working in batches and adding additional oil as needed, add the beef in one layer to the hot oil. Cook, turning occasionally, until beef is well browned on all sides, about 8 minutes. Transfer beef to a plate and reserve for later. Reduce the heat to medium then add the garlic and tomato paste to the same pot as the beef was seared in. Cook, stirring often until fragrant, about 1 minute. Stir in the beer, beef stock, Worcestershire sauce, and thyme. Bring to a low simmer then add the beef back into the pot. Cover with the lid and transfer to the oven. Cook, stirring occasionally, for 1 hour. While the beef cooks, in a large skillet, heat the remaining 2 tablespoons of oil over medium heat. Add the onions, carrots, and celery. Season with a pinch of salt and pepper then cook, stirring often, until the vegetables are lightly browned on all sides, about 10 minutes. Set aside. After one hour, remove the lid of the Dutch oven and stir in the onions, carrots, celery and potatoes. Simmer with the lid partially open, until the beef is tender, 45 minutes to 1 hour longer. If the top of the stew becomes dry, add some extra beef stock. Remove stew from the oven, skim off any excess fat from the surface, adjust with additional salt and pepper to taste, then serve. 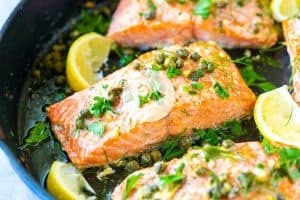 If you do not have a Dutch oven, you can sear the beef in a large pot on the stovetop then add everything to a large baking dish loosely covered with aluminum foil.